At the Renaissance Fair in Irvindale, CA this peddler took a little break from selling his wares. Intrigued by all the goodies in his basket, I inched closer to have a peek. Since I see a painting in just about anything that catches my attention, I wondered how peddlers have been represented in art. 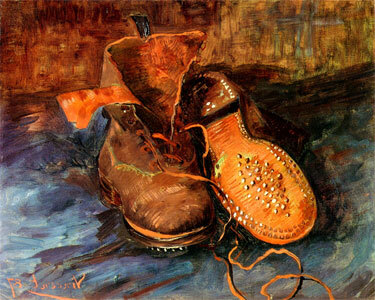 Van Gogh obviously took note of the travelling salesman's worn shoes. There are many little sculptures of peddlers and paintings of Flower peddler/sellers, although I would not consider them in the same category as the traveling salesmen.